Alas, the blog got bumped down in my priorities recently. I've been writing posts in my mind, but they somehow have not made the way to the page. 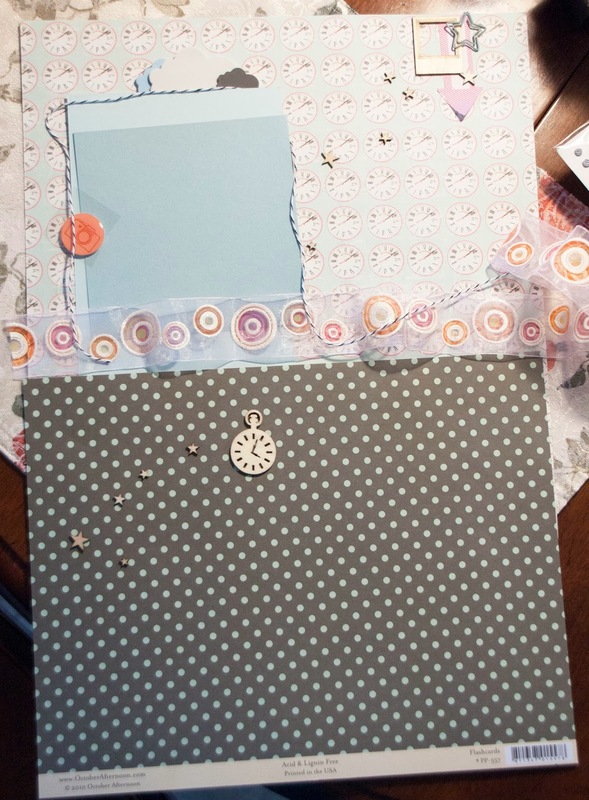 Today, I got some photos into my computer and thought that this page about scrapbooking should get me back in the groove. 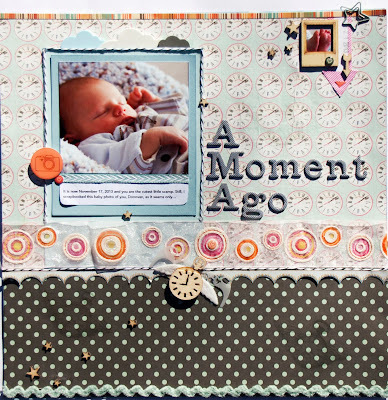 As many of you know, I do love Debbie Hodge's classes/magazine, Masterful Scrapbook Design http://masterfulscrapbookdesign.com/ and Get It Scrapped http://classroom.debbiehodge.com/. 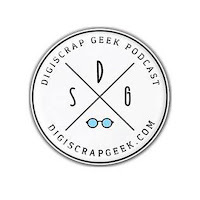 Right now on MSD, a color magazine and classes are the topic. I ran into my scrap room when this class came out and grabbed a few supplies. If you don't know me, you may not realize that primary colors are my favorite color scheme. I picked up a red, white and blue clock paper and what I thought was a similar hue dotted paper and settled on wood veneer for my yellow. As I laid down what I had found on the kitchen table, I noticed right off that the blue ink on the dot paper might have been the same hue to start but printed on a cream based paper vs. the white used in the clock face paper so had a greenish cast. I thought it would still work if I used more blue papers and separated the two patterned papers with some contrasting color. The red and orange take on a bit of the underlying blue hue bit I liked the transparency, so I decided to live with it. I determined that my main color story despite my minor deviations was a split complimentary one on an 18 color wheel. Unfortunately, there are several "color theories" around or, fortunately (if you like options), so it can get a little confusing. It's a topic that I will possibly explore in a future post. At any rate, I decided to use blue-green and red/pink and red-orange and use wood veneer that one can view as either a neutral or the yellow of a basic primary color scheme. Grey and white were are used as my other neutrals. I then gave some thought to the story. 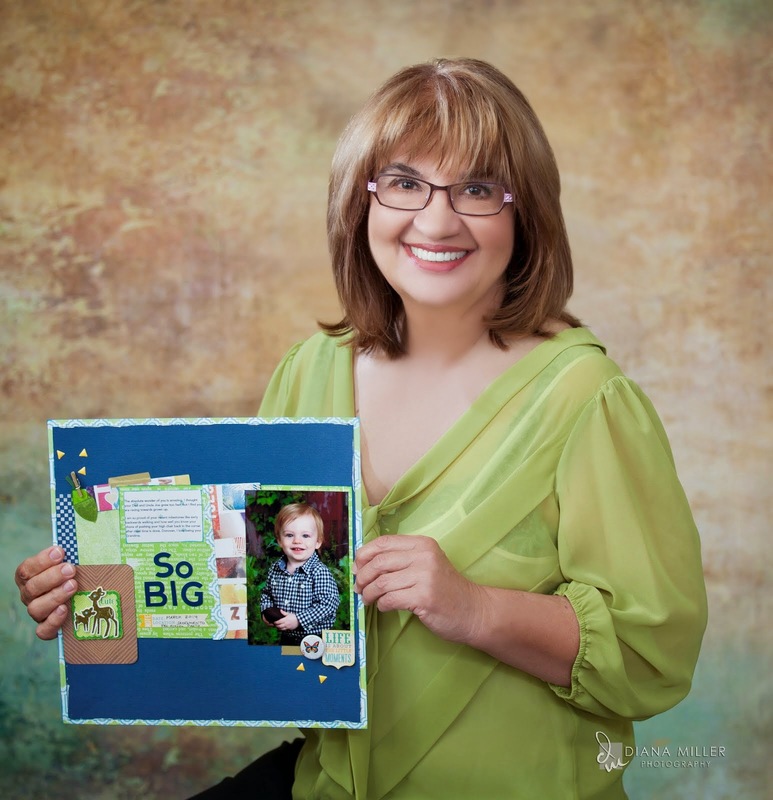 I was thinking of time for bed and considered photos of my sweet grandson and looking through the photos inspired my final page. At this point, I had the basic page structure with photo, title and the start of an embellishment triangle. A journal entry and it could be considered complete. Here is the final result. I used a small border strip that had my color story in stripes. 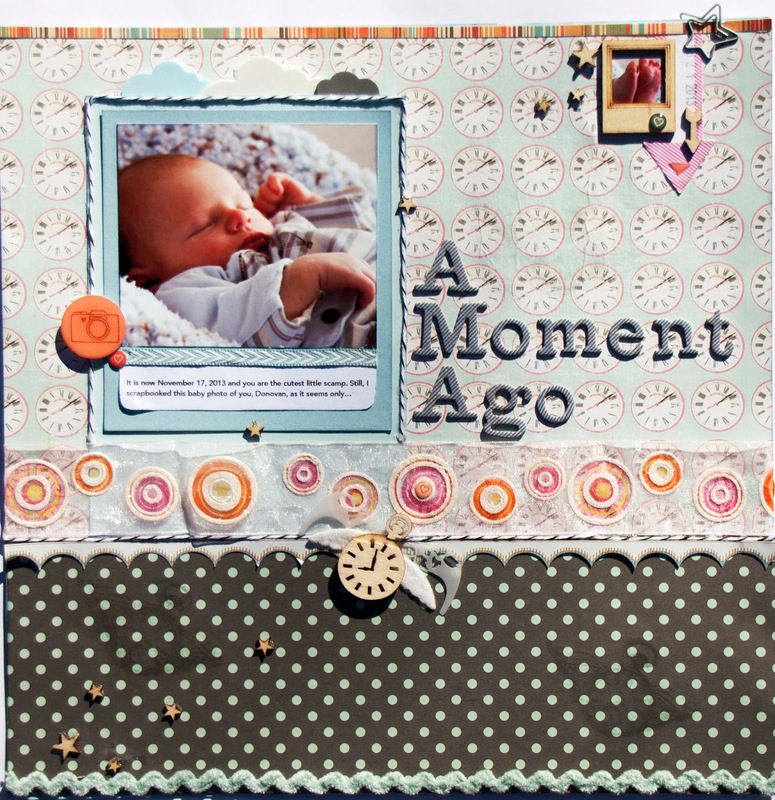 A border remnant gave me another line of definition between the pattern papers and echoes the arches of the clouds and the circles of the clocks, the principal ribbon print, the bottom of the journal strip and the polka dot paper. The fuzzy ric rac ribbon echoes this, too. The ric rac repeats greener shade of the blue-green polka dot paper and repeats the soft texture of the velour wings and foam clouds. The shape of the clock hands repeats in the red arrow label, the small veneer arrow, the chevron of the blue-green ribbon strip below the photo and the actual clock hands in the print and the clock veneer embellishment. Circles recur in the prints, the epoxy stickers, the clock and camera lens shapes and the details of the translucent ribbon. Stars sprinkle across the page giving the sense of movement through time as does the clock with wings. This motif repeats in a paper clip at the top cluster. The clock with wings is watermarked stamped in the patterned papers. The stars and clouds draw attention to the sleeping baby. Black would have been too harsh a neutral with the pastels on this page. I chose gray instead, and it shows up several times in the papers, title alphas, border strip, a cloud and the twine. The alphas and twine have a similar feel with diagonal stripes. The two photos and the camera epoxy make yet another triad theme within the page. I think it is a success. I had a scary moment when I stamped with a bit of gray into the watermark image on the clock patterned paper. It looked much too dark. Ink Refresher lightened that up but stretched the paper to ripple it. Once dry, I attached the layout with plenty of strong dry adhesive to a thin sheet of patterned paper and saved the piece. Necessary, since I could not find another sheet of the patterned paper to redo the page! 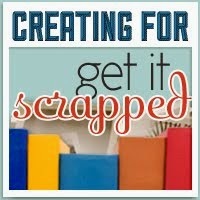 I know scrapbookers often enjoy the process of the page and hope my effort in this blog post was interesting. Lots going on right now. Retirees do wonder how they fit in life when they worked, and I'm no exception. However, I am finally getting around to clearing up that backlog of my life that's, at least, eight years old. It feels good. Now there's time to play and create, which is wonderful. I write a lot of blog posts in my mind too. :) Great layout - so glad you were able to save it. You'd never know.